The holidays are our favorite time of the year at City Orthodontics, for many reasons. The amazing smells in the kitchen, the holiday get-togethers, family reunions, and especially giving back to the community. What better time to give back to those less fortunate than us, then during Thanksgiving and Christmas when time is most treasured when spent with family. 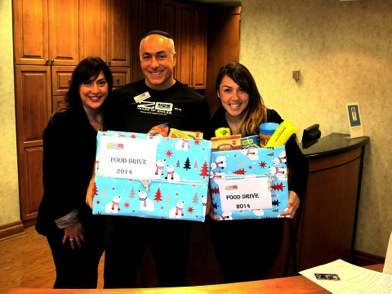 This past Thanksgiving, City Orthodontics decided to help with a holiday food drive where all proceeds collected were donated to the Daily Bread Food Bank. Some items requested included canned fruits and vegetables, rice, mac & cheese, peanut butter, baby formula, dried pasta, tomato sauce and more. We thought this would be a fantastic time to get together as a team at our Toronto orthodontic practice, and give back to those in need. With the help of our doctors, team and patients, we contributed to the Daily Bread Food Bank in a big way!